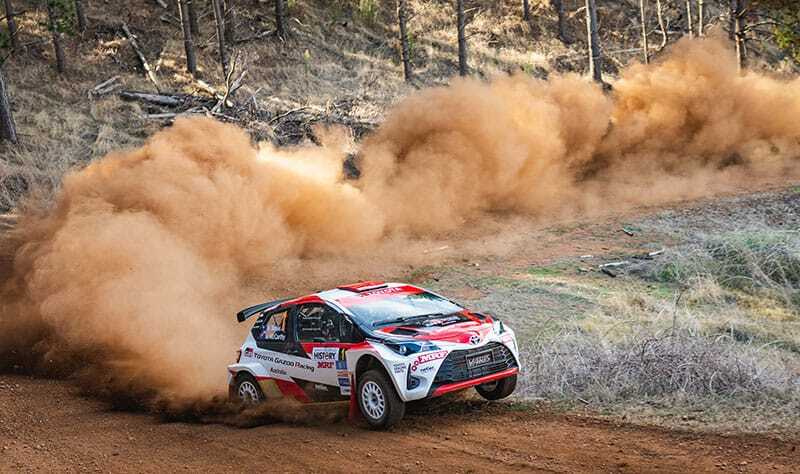 Toyota Chief Marketing Officer Wayne Gabriel said it was a superb start to the season for the team and confirmed Toyota’s faith in the factory-backed Toyota GAZOO Racing Australia rally team. “Our commitment to run a two-car Yaris campaign in the 2019 Australian Rally Championship is already paying dividends with an excellent result in the first round of the season and we couldn’t be happier,” Mr Gabriel said. “In team principal Neal Bates, we have a four-time Australian rally champion legend whose long association with Toyota has brought us enormous motorsport success over the past three decades, and now his sons Harry and Lewis are showing very promising signs of following in their father’s rally tracks. “We want to congratulate the entire team on its outstanding effort in preparing both cars – one of them brand new that was still being built just weeks ago – and following through with faultless drives from Harry, Lewis and their co-drivers,” he said. Lewis kicked off the weekend with a win in his first competitive drive in the Yaris in the two-run Super Special Stage through Busselton on Friday night that saw him and McLoughlin go into Saturday’s heat 1 just 0.1 seconds ahead of Harry and John. But Harry’s precision driving throughout Saturday gave him six wins in the eight stages to finish on top after heat 1, 29.9 seconds ahead of Lewis. Harry extended his lead over Lewis through Sunday’s special stages to take the overall win and top the driver’s leaderboard with 81 points for the round ahead of Lewis in second place on 68. “We really had to put so much effort into getting the new car ready in time and it proved faultless, fast and so good to drive,” Harry said. “The car feels amazing to drive. I tested it last week and then again in the pre-event test but in the rally, it just gives me confidence to drive it even harder and harder, so I am really happy how the Yaris is performing,” Lewis said.